See more images below of this great meet-up in the skies, and see our earlier post of our readers’ images here. Comet C/2011 L4 Panstarrs and the Andromeda Galaxy: Two Frame Mosaic from New Mexico Skies, April 4, 2013. Taken from New Mexico Skies at 23:22 UT using an FSQ 10.6-cm and STL11K camera. Credit and copyright: Joseph Brimacombe. Exposure: 9 x 5min, ISO 1600, F5, 6 x dark frames, 6 x flats frames. Equipment: Canon 1000D, CG5 Mount, Sigma 70-300mm set at 200mm. Credit and copyright: Brendan Alexander. Comet PANSTARRS and M31 taken from the Scottish Dark Sky Observatory on April 3, 2013. Credit and copyright: Dave Hancox via Google+. Comet C/2011 L4 (PANSTARRS) and M31 (Andromeda Galaxy) taken from just outside St Clears, Carmarthenshire, Wales on 29th March 2013 around 9pm. Credit and copyright: Pete Newman. Comet PANSTARRS and the Andromeda galaxy over Suffolk, England on April 2, 2013. This composite images shows the movement of the comet during the imaging session. Credit and copyright: Anna Morris. Did you capture this event, too? Let us know, or upload your images to our Flickr page. Astronomers have known for years that our Milky Way and its closest neighbor, the Andromeda galaxy, (a.k.a M31) are being pulled together in a gravitational dance, but no one was sure whether the galaxies would collide head-on or glide past one another. Precise measurements from the Hubble Space Telescope have now confirmed that the two galaxies are indeed on a collision course, headed straight for a colossal cosmic collision. No need to panic for the moment, as this is not going to happen for another four billion years. And while astronomers say it is likely the Sun will be flung into a different region of our galaxy, Earth and the solar system will probably just go along for the ride and are in no danger of being destroyed. The simulations Besla was talking about came from precise measurements by Hubble, painstakingly determining the motion of Andromeda, looking particularly at the sideways motion of M31, which until now has not been able to be done. “This was accomplished by repeatedly observing select regions of the galaxy over a five- to seven-year period,” said Jay Anderson of STScI. Right now, M31 is 2.5 million light-years away, but it is inexorably falling toward the Milky Way under the mutual pull of gravity between the two galaxies and the invisible dark matter that surrounds them both. Of course, the collision is not like a head-on between two cars that takes place in an instant. Hubble data show that it will take an additional two billion years after the encounter for the interacting galaxies to completely merge under the tug of gravity and reshape into a single elliptical galaxy similar to the kind commonly seen in the local universe. Astronomers said the stars inside each galaxy are so far apart that they will not collide with other stars during the encounter. However, the stars will be thrown into different orbits around the new galactic center. Simulations show that our solar system will probably be tossed much farther from the galactic core than it is today. There’s also the complication of M31’s small companion, the Triangulum galaxy, M33. This galaxy will join in the collision and perhaps later merge with the M31/Milky Way pair. There is a small chance that M33 will hit the Milky Way first. The astronomers working on this project said that they were able to make the precise measurements because of the upgraded cameras on Hubble, installed during the final servicing mission. This gave astronomers a long enough time baseline to make the critical measurements needed to nail down M31’s motion. The Hubble observations and the consequences of the merger are reported in three papers that will appear in an upcoming issue of the Astrophysical Journal. Fourth Row, Right: In 7 billion years the merged galaxies form a huge elliptical galaxy, its bright core dominating the nighttime sky. Source: HubbleSite See more images and videos here and here. Yep. It’s that time of year again. Time to enjoy the Andromeda Galaxy at almost every observing opportunity. But now, rather than just look at the nearest spiral to the Milky Way and sneaking a peak at satellites M32 and M110, we can think about something more when we peer M31’s way. There are two newly discovered dwarf galaxies that appear to be companions of Andromeda! Eric Bell, an associate professor in astronomy, and Colin Slater, an astronomy Ph.D. student, found Andromeda 28 and Andromeda 29 by utilizing the Sloan Digital Sky Survey and a recently developed star counting technique. To back up their observations, the team employed data from the Gemini North Telescope in Hawaii. Located at 1.1 million and 600,000 light-years respectively, Andromeda XXVIII and Andromeda XXIX have the distinction of being the two furthest satellite galaxies ever detected away from the host – M31. Can they be spotted with amateur equipment? Not hardly. This pair comes in about 100,000 fainter than Andromeda itself and can barely be discerned with some of the world’s largest telescopes. They’re so faint, they haven’t even been classified yet. “With presently available imaging we are unable to determine whether there is ongoing or recent star formation, which prevents us from classifying it as a dwarf spheroidal or a dwarf irregular.” explains Bell. In their work – published in a recent edition of the edition of the Astrophysical Journal Letters – the team of Bell and Slater explains how they were searching for dwarf galaxies around Andromeda to help them understand how physical matter relates to theoretical dark matter. While we can’t see it, hear it, touch it or smell it, we know it’s there because of its gravitational influence. And when it comes to gravity, many astronomers are convinced that dark matter plays a role in organizing galaxy structure. Right now, current consensus has all galaxies embedded in surrounding dark matter… and each “bed” of dark matter should have a galaxy. Considering the volume of the Universe, these predictions are pretty much spot on – if we take only large galaxies into account. Right or wrong… pondering dark matter and dwarf galaxies while observing Andromeda will add a whole new dimension to your observations! For Further Reading: Andromeda XXVIII: A Dwarf Galaxy more than 350 kpc from Andromeda and Andromeda XXIX: A New Dwarf Spheroidal Galaxy 200 kpc from Andromeda. 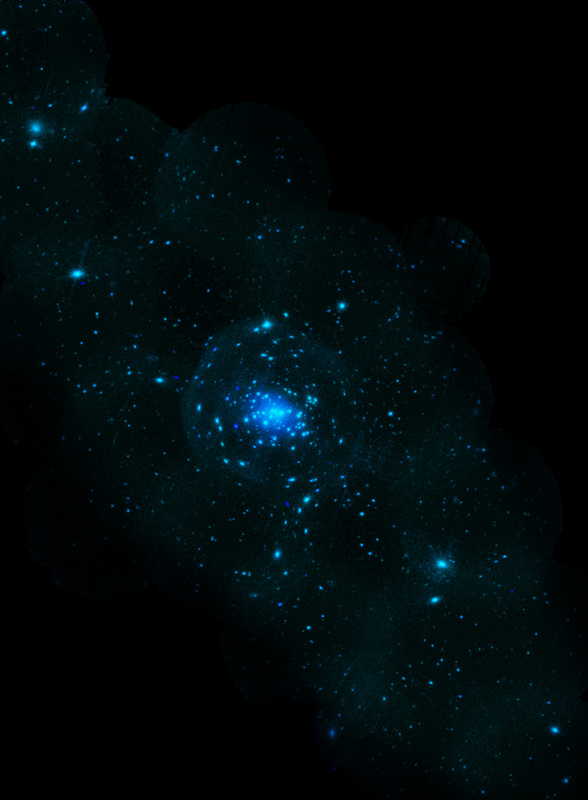 Globular clusters are generally some of the oldest structures in our galaxy. Many of the most famous ones formed around the same time as our galaxy, some 13 billion years ago. However, some are distinctly younger. While many classification schemes are used, one breaks globular clusters into three groups: an old halo group which includes the oldest of the clusters, those in the disk and bulge of the galaxy which tend to have higher metallicity, and a younger population of halo clusters. The latter of these provides a bit of a problem since the galaxy should have settled into a disk by the time they formed, depriving them of the necessary materials to form in the first place. But a new study suggests a solution that’s not of this galaxy. The new study looked at the distribution of these younger clusters around our Milky Way. Of the three classifications for globular clusters discussed, the young halo clusters are scattered well beyond the range of the other populations. The young halo extends to as much as 120 kiloparsecs (400 thousand light years) while the old halo clusters tend to lie within 30 kiloparsecs (100 thousand light years). Additionally, the young clusters don’t appear to be rotating with the disk of the galaxy whereas the old halo slowly orbits in the same direction as the disk. In looking more carefully at the positions of these satellites, the team, led by Stefan Keller at the Australian National University, found that the younger population tends to lie in a wide plane that is tilted from the rotational axis of our galaxy by a mere 8°. This plane is strikingly similar to another recognized grouping of objects: Many of the known dwarf galaxies lie in a nearly identical plane, known as the Plane of Satellites (PoS). This finding suggests that this population of globular clusters is a relic of cannibalized galaxies. Even more interesting is that, while these objects are younger than the distinctly “old” population, there is still a large variation in their ages. This implies that this plane wasn’t created by the accretion of one, or even a few minor galaxies, but a consistent feeding of small galaxies onto the Milky Way for much of the history of the universe, and all from the same direction. Studies of the distribution of satellites around our nearest major neighbor, M31, the Andromeda galaxy, has turned up a similar preferred plane, tilted some 59° from its disk. One explanation for this is that this is a preferred direction that traces invisible filaments of dark matter. While dark matter distributions are difficult to predict, models haven’t accounted for such strong filamentary structure on such small scales. Rather, in the neighborhood of our galaxy, the overall distribution is described as an oblate spheroid. One of the reasons astronomers believe our own dark matter halo is so nicely shaped is the way it is affecting the Sagittarius dwarf galaxy which is slowly being accreted onto our own. If the dark matter were more wispy, it should be stretched out in different manners. Another possibility the authors consider is that the objects were created in a preferred plane “from the break up of a large progenitor at early times”. In other words, the filament could be a fossil of larger structure before our galaxy formed along which these dwarf galaxies formed and from which these galaxies could have been slowly accreting over the history of the galaxy. Andromeda is a beautiful galaxy to see with your own eyes, but in this video, ESA’s fleet of space telescopes — XMM Newton, Herschel, Planck and several ground-based telescopes — has captured M31, in different wavelengths, most of which are invisible to the eye. Each wavelength shows a different aspect of the galaxy’s nature, as well as providing a look at the lifecycle of the stars that make up Andromeda. A team of astronomers from the UK, the US and Europe have identified a thick stellar disc in the nearby Andromeda galaxy for the first time. The discovery and properties of the thick disc will constrain the dominant physical processes involved in the formation and evolution of large spiral galaxies like our own Milky Way. By analyzing precise measurements of the velocities of individual bright stars within the Andromeda galaxy using the Keck telescope in Hawaii, the team have managed to separate out stars tracing out a thick disc from those comprising the thin disc, and assess how they differ in height, width and chemistry. Currently, the formation process of the thick disc is not well understood. Previously, the best hope for comprehending this structure was by studying the thick disc of our own Galaxy, but much of this is obscured from our view. The discovery of a similar thick disk in Andromeda presents a much cleaner view of spiral structure. Andromeda is our nearest large spiral neighbor — close enough to be visible to the unaided eye — and can be seen in its entirety from the Milky Way. Astronomers will be able to determine the properties of the disk across the full extent of the galaxy and look for signatures of the events connected to its formation. It requires a huge amount of energy to stir up a galaxy’s stars to form a thick disc component, and theoretical models proposed include accretion of smaller satellite galaxies, or more subtle and continuous heating of stars within the galaxy by spiral arms. This study was published in Monthly Notices of the Royal Astronomical Society by Michelle Collins, Scott Chapman and Mike Irwin from the Institute of Astronomy, together with Rodrigo Ibata from L’Observatoire de Strasbourg, Mike Rich from University of California, Los Angeles, Annette Ferguson from the Institute for Astronomy in Edinburgh, Geraint Lewis from the University of Sydney, and Nial Tanvir and Andreas Koch from the University of Leicester. To the naked eye, the Andromeda galaxy appears as a smudge of light in the night sky. But to the combined powers of the Herschel and XMM-Newton space observatories, these new images put Andromeda in a new light! Together, the images provide some of the most detailed looks at the closest galaxy to our own. In infrared wavelengths, Herschel sees rings of star formation and XMM-Newton shows dying stars shining X-rays into space. 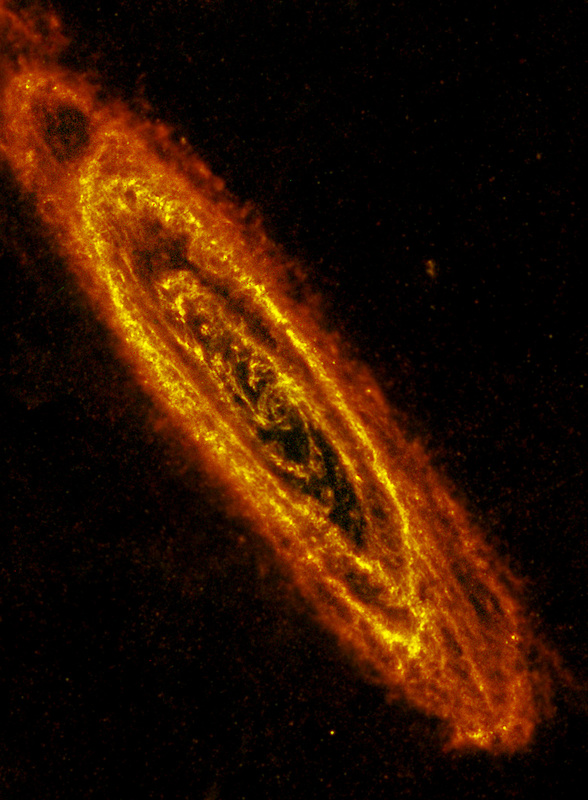 During Christmas 2010, the two ESA space observatories targeted Andromeda, a.k.a. M31. Andromeda is about twice as big as the Milky Way but very similar in many ways. Both contain several hundred billion stars. Currently, Andromeda is about 2.2 million light years away from us but the gap is closing at 500,000 km/hour. The two galaxies are on a collision course! In about 3 billion years, the two galaxies will collide, and then over a span of 1 billion years or so after a very intricate gravitational dance, they will merge to form an elliptical galaxy. Sensitive to far-infrared light, Herschel sees clouds of cool dust and gas where stars can form. Inside these clouds are many dusty cocoons containing forming stars, each star pulling itself together in a slow gravitational process that can last for hundreds of millions of years. Once a star reaches a high enough density, it will begin to shine at optical wavelengths. It will emerge from its birth cloud and become visible to ordinary telescopes. Many galaxies are spiral in shape but Andromeda is interesting because it shows a large ring of dust about 75,000 light-years across encircling the center of the galaxy. Some astronomers speculate that this dust ring may have been formed in a recent collision with another galaxy. This new Herschel image reveals yet more intricate details, with at least five concentric rings of star-forming dust visible. Superimposed on the infrared image is an X-ray view taken almost simultaneously by ESA’s XMM-Newton observatory. Whereas the infrared shows the beginnings of star formation, X-rays usually show the endpoints of stellar evolution. XMM-Newton highlights hundreds of X-ray sources within Andromeda, many of them clustered around the centre, where the stars are naturally found to be more crowded together. Some of these are shockwaves and debris rolling through space from exploded stars, others are pairs of stars locked in a gravitational fight to the death. In these deadly embraces, one star has already died and is pulling gas from its still-living companion. As the gas falls through space, it heats up and gives off X-rays. The living star will eventually be greatly depleted, having much of its mass torn from it by the stronger gravity of its denser partner. As the stellar corpse wraps itself in this stolen gas, it could explode. Together, the infrared and X-ray images show information that is impossible to collect from the ground because these wavelengths are absorbed by Earth’s atmosphere. Visible light shows us the adult stars, whereas infrared gives us the youngsters and X-rays show those in their death throes.